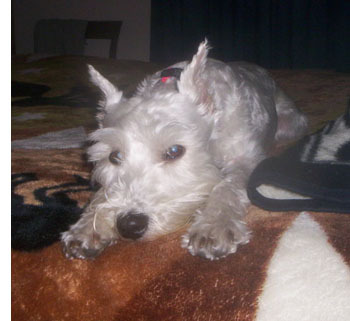 Dear Adopt-a-Pet.com, I used your listings and finally found and adopted a Miniature Schnauzer, at the Western Arizona Humane Society shelter in Kingman, Arizona, listed through your service. Roxy is the sweetest girl and I was lucky to find her. WAHS was very nice to deal with and the animals are taken care of with love. Foxy now has a great home and she is just a doll! I can’t believe someone would turn her and her brother into a shelter, I just couldn’t do that. I took a drive from Las Vegas to Kingman, about a two-hour drive and had already put a two-day hold on her as didn’t know when I could get there. When I got there I played with her and she seemed very friendly, and hopped right up on my lap. After getting home Foxy started to relax. However, she is very attached to me already and doesn’t like to be alone or with other people. I am having to leave her with people to get her used to me coming back, as she thinks I’m not coming back and that she’s being left again. NO WAY!!! Foxy is a great dog and I’m lucky to have found her. Thanks again for your love of animals and dedication.